Scrap Car Kings are a highly professional scrap car Canary Wharf service, specialising in the removal, collection and disposal of cars ready for scrap in the East. We deal with MOT failures, written off and non-running vehicles, and scrap them responsibly and efficiently at our fully certified, authorised treatment facility. We carry out all required legal paperwork and dispose of your vehicle with very little impact on the environment. 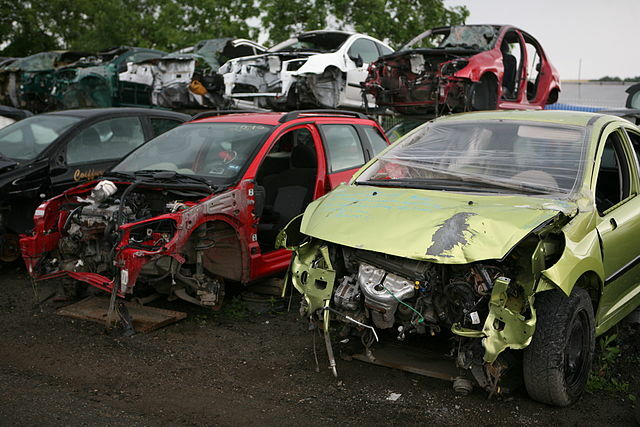 Over 2 million cars are recycled and scrapped in the UK each year, could yours be next? Using our straightforward method for car scrapping, we provide you with the best possible value for your unwanted car through instant funds to your account. Whether your car is too old to maintain or run, failed its MOT or is sat on your driveway not being used, it’s time to get it off of your hands. It’s becoming increasingly harder to sell old cars, as people are more interested in a vehicle that is more environmentally-friendly and cheaper to run. We offer a professional, fully licensed car scrapping Canary Wharf service; we can collect your vehicle the same day and we will complete all necessary DVLA paperwork upon collection. Selling a car has never been easier! If you want to scrap a car in Canary Wharf for some quick cash, then you’ll be pleased to hear that the process is simple and hassle-free from start to finish! To find out how much your car is worth for scrap, simply enter your car reg number into our online form and we will send you a FREE quote. Once you’ve accepted the quote, we transfer the funds into your account and collect the vehicle the same day – it’s as easy as that. Your car will be scrapped at a fully certified, authorised treatment facility, so you can rest assure your car is being scrapped legally and with very little impact on the environment. Contact Scrap Car Kings today for a free quote on scrapping your car in Canary Wharf.